« Don’t bailout the automakers! Citigroup, better known as Citibank, has now been bailed out by our federal government. This action is both gratuitous and illegal. It is not the position of our government to show favoritism. There is a legal mechanism for companies in trouble – we all know what it is – it’s called bankruptcy. Bankruptcy comes in two flavors, Chapter 11, and Chapter 7. Chapter 11 bankruptcy gives protection for companies that have a chance of saving themselves. With the consent of the bankruptcy court, the company is allowed to put its affairs in order. The court protects the company primarily from the company’s creditors. Such protection is good for the creditors, as it gives them a chance to be repaid, and it gives a chance for the bankrupt company to emerge from bankruptcy as a viable business entity. Chapter 7 bankruptcy dissolves the company, pays the creditors from whatever assets the company may have. The company does not survive Chapter 7 bankruptcy – it ceases to exist. In the case of Citibank, Chapter 11 bankruptcy would have been appropriate. Giving Citibank billions of dollars does nothing to force the bank to change its ways or to put its affairs in order. Citibank can continue on its mistaken path to lose more money, and to request additional bailouts. There’s an expression for what the federal government is doing with Citibank – it’s called throwing good money after bad. This brings us to the point of considering just how bad Citibank is. By happenstance, I have had a long history with Citibank, going back to my high school days. One of my high school friends was the grandson of Frank Vanderlip, the founder of what is now Citibank. My school chum invited me during summer vacation to be a houseguest at Beechwood, the Vanderlip estate in Scarborough, New York. At the time of my visit, many years ago, Frank Vanderlip had passed away, but his widow was still alive. Dinners were served on a long outside terrace with everyone sitting on the east side of the long dining table. This way, we all shared a magnificent view of the Hudson River, below. As expected the house was immense. My high school chum, a very polite fellow, gave me a tour of the place. At one point we came upon a huge and beautiful room paneled with dark oak. The room was at least two stories high, but there was something strange about it – it was lacking a single stick of furniture. I asked my good friend why such a beautiful room was unfurnished. “Oh, this is for the horse shows,” he replied. Back in those days Citibank, then called First National City Bank, was a very waspish outfit. It was a corporate bank, limiting its clients to well-healed corporations. Over the years, First National City Bank morphed into Citibank, with a large consumer side added to its business, including consumer banking, credit cards, and sub-prime mortgages. In 1989, I went to work for Citibank in Singapore. I was tasked to set up a major computer processing center for credit cards, and consumer banking. 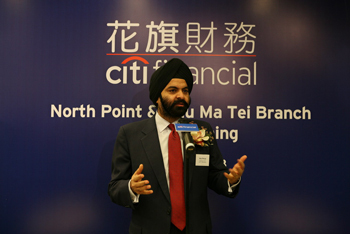 The effort was extremely successful, as Citibank expanded into many countries in Asia and beyond. The processing center in Singapore wound up handling transactions from Europe to Latin America. My boss at Citibank was a very bright Sri Lankan, and, over the years, we got to know each other quite well. During the period from 1989 to 1996, Citibank was taken over by what my boss called the “Indian Mafia.” His boss’s boss was an Indian, originally hired by Citibank to work in Saudi Arabia. The Indian take-over of Citibank was rapid. It has now become complete with the appointment of Vikram Pandit as CEO on December 11, 2007. Pandit had been running a hedge fund, Old Lane Partners, which Citigroup purchased in 2007 for $800 million, ostensibly to hire Pandit – who received approximately $165.2 million for this transaction. Pandit is assisted by Ajay Banga, who handles Citibank, Asia. Pandit, who claims he likes the simple life – no Gordon Gekko he, just plunked down $17.9 million for Tony Randall’s apartment in Central Park West’s Beresford Building, a ten-room spread that occupies an entire floor. There, Pandit and his wife, Swati, live with their daughter, Maya and son, Rahul. Yes, Indian Citibank needs a helping hand from the US taxpayers. In total, Citibank will receive approximately $306 billion – about $1 million for every Citibank employee, at a cost of about $1,000 for every man, woman, and child in the United States. This should really help India. Not at all. My boss at Citibank, a Sri Lankan, did complain a bit about the Indian Mafia, but who knows? Citibank treated me very well, and still does. It was a great company to work for, as I had complete freedom to run the datacenter as I pleased – and it worked! That was very satisfying. Citibank was the best. But why did Citibank choose a hedge fund guy, Pandit, to be their CEO. Why not a banker. My bosses boss at Citibank, Rana Talwar, was an Indian. They should have brought him back. Instead, afraid of his talent, they moved him to Chicago, where he quit and went on to head Standard Chartered. No sour grapes here, my friend.